It's a certified cinema classic and one of the most quotable movies ever. Two years after Reservoir Dogs, video store clerk turned auteur Quentin Tarantino turned out another masterpiece in Pulp Fiction, the 1994 movie that rescued John Travolta from the pop culture waste bin via a now iconic performance, matched in creative and artistic firepower by Uma Thurman, Bruce Willis, Tim Roth, Harvey Keitel, Christopher Walken, Eric Stoltz, Rosanna Arquette, Amanda Plummer, Ving Rhames, and of course, Samuel L. Jackson as the soul searching hit man Jules. Pulp Fiction still regularly plays in midnight showings at the writer/director's own New Beverly Cinema. 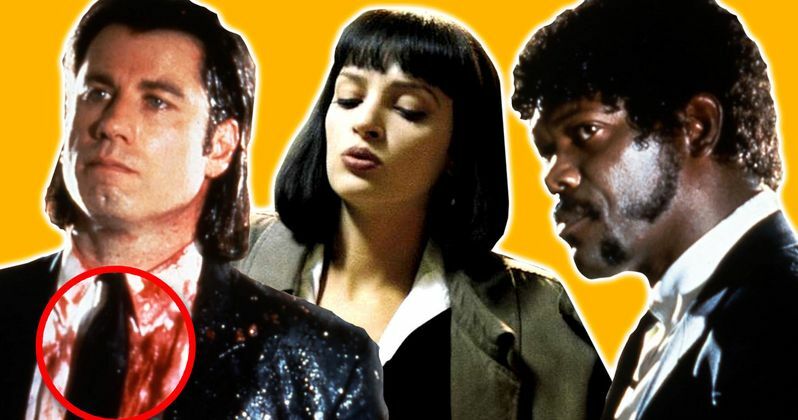 Today we look at 10 things you never knew about Pulp Fiction. Matt Dillon was almost Butch. Originally Quentin Tarantino conceived of the "palooka" pugilist played by Bruce Willis as a younger up and coming boxer. He envisioned Matt Dillon in the role. But after the actor reportedly took too long to decide, Tarantino reworked the character and cast Willis, who had initially hoped to play hit man Vincent Vega instead. Michael Madsen was almost Vincent. Tarantino wrote parts specifically for many of the actors in Pulp Fiction, including Samuel L. Jackson. But his hit man partner was supposed to be played by Michael Madsen, which would have made Vincent Vega the twin brother of Mr. Blonde, aka Vic Vega, from Reservoir Dogs. Madsen dropped out to make Wyatt Earp instead. In 2007, Tarantino revealed his title for a proposed Vega brothers prequel: Double V Vega, explaining in the same interview that both actors had aged out of the parts. Julia Louis-Dreyfus was offered the role of Mia Wallace, according to her agent, but she was too busy with Seinfeld. Halle Berry, Meg Ryan, Isabella Rossellini, Daryl Hannah, Joan Cusack, and Michelle Pfeiffer are all said to have auditioned for the part. As the story goes, Tarantino wanted Uma Thurman so much that he read her the entire script by phone. The pair of course worked together many more times. Vincent and Mia stole that dance trophy. Speaking of Vincent and Mia, super fans, repeat viewers, and sharp-eared first timers were rewarded with a little bit of cool trivia. Remember how Mia and Vince return home with the trophy from Jack Rabbit Slims? A radio report heard elsewhere in the movie reveals that the trophy was actually stolen. Which means Vincent and Mia didn't win the competition at all. They just stole the trophy. And speaking of stealing, remember that cool 1964 Chevy Malibu Vincent Vega drives? Eventually, the director solved one of the movie's mysteries: it was Butch who keyed Vincent's car. That Malibu belonged to Tarantino in real life and it was stolen after filming. Police actually recovered the vehicle nearly 20 years later. The wallet Jules carried also belonged to the filmmaker. As far as know, that's still safe. Would you believe that Quentin Tarantino isn't the only director who worked on Pulp Fiction? Robert Rodriguez stepped in to direct the scenes where his pal QT acts in the film. Tarantino reportedly considered playing Lance, but chose not to, as he wanted to make sure he was behind the camera for Mia's now famous overdose. The needle and the damage done. The most famous moment in that overdose scene is when Vincent Vega shoves that adrenaline spike into Mia Wallace's chest. It's a very convincing stunt, which was executed with some old fashioned non-CGI ingenuity. In real life, Travolta actually pulled the needle out of Thurman's chest, then the footage played in reverse. Cool. Samuel L. Jackson's hit man Jules loved to quote the Old Testament just before he whacked somebody. After a potentially supernatural incident spares his life, he finds himself reflecting on that bit of scripture he'd memorized, concluding that he's going to give up his life of crime in order to be a drifter and "walk the earth like Caine." But only the last two lines appear in the Bible. The rest of Ezekiel 25:17 was just some stuff Jackson and Tarantino cooked up together. By the way, that character, Caine? Caine was the protagonist of television's Kung Fu, played by David Carradine. The late actor would of course star as the title character in Tarantino's Kill Bill. There are Reddit threads devoted to the idea that Jackson's Kill Bill character is actually Jules. Ok, fine, we'll do one more! In Pulp Fiction, Bruce Willis sings along to The Statler Brothers' "Flowers on the Wall," crooning the line, "smoking cigarettes and watching Captain Kangaroo." Samuel Jackson joined the Die Hard franchise the following year. During one scene in Die Hard with a Vengeance, John McLane tells his character that he spent his suspension, "Smoking cigarettes and watching Captain Kangaroo."